I have a confession to make. I’m an unashamed sound of music fan. It’s one of my favourites movies and something that reminds me of my childhood. So Salzburg was very high on the list if places to visit. And I was not disappointed. 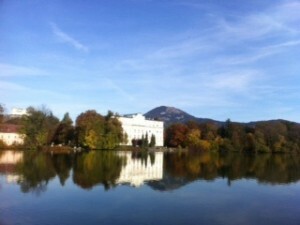 Salzburg is a beautiful city. It is picturesque and a good mix and old and new. It has a rich history , both sad and happy but is perhaps most famous for being the birthplace of Mozart and of course the Sound of Music. So popular is Salzburg that 8 million people visit every year. So things to see and do. 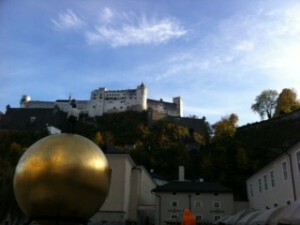 The Festung Hohensalzburg is an amazing fortres that overlooks the old town. It also is home to classical concerts during the year. We went with Gray line tours booked through the tourist centre in the old town. We had some amazing traditional food and local wine. A highly recommended restaurant is Zum Fidelen Affen, we had fabulous goulash and wine there. The staff were friendly and accommodating on a busy night with no reservation.